An original letter of correspondence between Joshua Coffin Chase and Isleworth Packing House Superintendent Corbett Hutchinson. 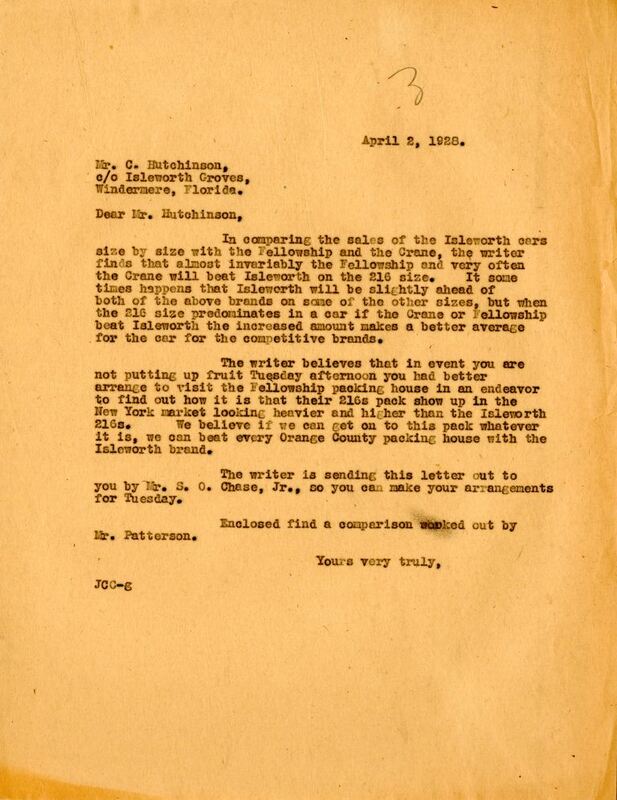 Topics discussed in the letter include the size of Isleworth cars in comparison of cars of the Fellowship and of the Crane and instructions to visit the Fellowship packinghouse. Original letter from Joshua Coffin Chase to Corbett Hutchinson, April 2, 1928: box 49, folder 20.91, Chase Collection (MS 14), Special and Area Studies Collections, George A. Smathers Libraries, University of Florida, Gainesville, Florida. Digital reproduction of original letter from Joshua Coffin Chase to Corbett Hutchinson, April 2, 1928. Collection, Citrus Collection, Chase Collection, RICHES of Central Florida. In comparing the sales of the Isleworth cars size by size with the Fellowship and the Crane, the writer finds that almost invariably the Fellowship and very often the Crane will beat Isleworth on the 216 size. It some times happens that Isleworth will be slightly ahead of both of the above brands on some of the other sizes, but when the 216 size predominates in a car if the Crane or Fellowship beat Isleworth the increased amount makes a better average for the car for the competitive brands. The writer believes that in event you are not putting up fruit Tuesday afternoon you had better arrange to visit the Fellowhip packing house in an endeavor to find out how it is that their 216s pack show up in New York market looking heavier and higher than the Isleworth 216s. We believe if we can get on to this pack whatever it is, we can beat every Orange County packing house with the Isleworth brand. The writer is sending this letter out to you by Mr. S. O. Chase, Jr., so you can make your arrangements for Tuesday. Enclosed find a comparison worked out by Mr. Patterson. Chase, Joshua Coffin. 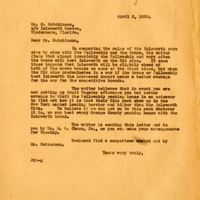 “Letter from Joshua Coffin Chase to Corbett Hutchinson (April 2, 1928).” RICHES of Central Florida accessed April 23, 2019, https://richesmi.cah.ucf.edu/omeka/items/show/2770.